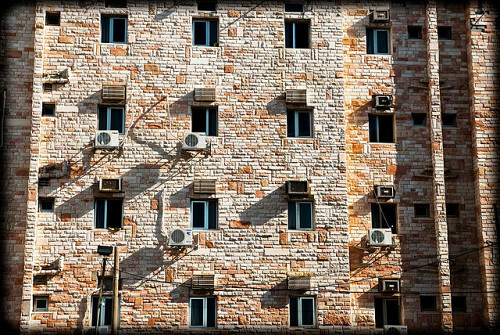 Is there a bad smell coming from your window air conditioning unit? If so, you may be thoroughly grossed out, but you're definitely not alone. This is actually a common problem and for most air conditioning owners, it's just a matter of time before they're faced with the same disgusting dilemma. Here's how to track down and get rid of that nasty odor. Is it the drip tray? Deep inside your air conditioner, dust and water and heat are working in conjunction to provide an environment perfectly conducive to fungus, mold and mildew growth. And that sour smell now emanating outward is probably originating from the drip tray, where condensation collects as a pool of dusty, dirty water. Down there, the sludge begins to stink. It's also worth noting that the bad smell could be coming from a filter, so always check those first. If it's possible that replacing the filter could clear up the offending odor, you'll have saved yourself a lot of trouble. 1. Remove the outer case of the air conditioning unit. On smaller units the outer case will lift off to expose the coils, fan, and compressor. On a larger unit, loosen the case and then slide the inner components towards you, being careful not to bend the metal fins, which are made of flimsy aluminum. 2. Be cautious. Be careful whenever you remove anything other than the outer case. AC units are pressurized systems with a charged capacitor capable of causing electric shock. Make sure that you are familiar with each piece you remove, and that you know the proper method for removing and reattaching it. 3. Clean the AC unit. Take the un-cased AC unit outside and set it on a surface that can withstand bleach and water (like saw horses, or your driveway). Use compressed air to blow off all the dirt and debris that's caught inside the unit. Be careful not to blow too hard and damage the inner parts! Now, use a damp cloth to wipe down the inner components, removing any last bits of dust or debris. 4. Clear the drain line. Remove the drain line. Soak it in a solution of 1:3 bleach in water, and flush the bleach solution through the line. Then, rinse it with plain water and allow it to dry completely before reattaching it. 5. Clean the vent and fans. Spray the vent area (where cold air flows from) with that same bleach solution. Thoroughly soak it, checking for full penetration. Make sure you get it into the fans, while you gently turn them, to completely soak the surface. Let this sit for a while, then spray it down again, but with just plain water this time. Rinse away all the bleach solution. 6. Tackle that drip tray. Now, use a hose to wash all the collected sludge from the drip tray. Do not use too much water pressure here, instead let the water flow over the area for a few minutes to wash away all the gunk. You can use some of the bleach solution here as well, to thoroughly disinfect the drip tray. 7. Dry and reassemble. Allow the AC unit to completely air dry, which will take a few hours. Once it's dry you can bring it back inside and reattach the case. Between the debris removal, the bleach, and the thorough flushing with water, you should no longer be dealing with a bad smell coming from your air conditioning unit. But allow me to offer an ever-so-gentle reminder: this is why annual maintenance is so important! If you don't have the time or inclination to maintain your air conditioning unit, hire an HVAC pro to take care of it for you.